MINYA, Egypt – A judge in Egypt on Monday sentenced to death 683 alleged supporters of the country’s ousted Islamist president in the latest mass trial that included the Muslim Brotherhood’s spiritual leader, defense lawyers said. But in a surprise reversal, the same judge also reduced most of the death sentences handed to 529 defendants in a similar case in March, commuting the majority of them on Monday to life imprisonment. Hundreds were killed as part of a sweeping campaign against supporters of former President Mohammed Morsi, ousted by the military last July. The removal of Morsi — a year after he was elected — came after millions demonstrated against his rule, demanding he step down for abuse of power. Among those convicted and sentenced to death on Monday was Mohamed Badie, the Brotherhood’s spiritual guide. If his sentence is confirmed, it would make him the most senior Brotherhood figure sentenced to death since one of the group’s leading ideologues, Sayed Qutb, was executed in 1966. After Mufti’s decision, the same court will hold another session on June 21 to issue the final verdicts. Lawyer Ali Kamal, said the hearing lasted only eight minutes. Security forces surrounded the court building and blocked roads, preventing families and media from attending the proceedings. “This is against the spirit of the law. The verdicts will be easily appealed,” Kamal told reporters. A total of 148 defendants were present inside the court Monday, according to a judicial official in the case. It wasn’t immediately clear why the others were absent or if some of the suspects were tried in absentia. “Only the judge has the right and the power to reverse his earlier decisions,” the official said. In the surprise reversal on Monday, the judge commuted the death sentences for all but 37 defendants in the March trial of 529 Islamists. The remaining suspects were given life sentences. The March ruling had brought heavy international criticism from the United Nations, United States and European Union. At the time, Amnesty International called the death sentences “grotesque” and Egyptian rights groups were stunned at the swift verdicts, passed after only one hearing — and without defense presenting its case. Egypt’s interim, military-backed government has branded the Brotherhood a terrorist group, a claim it denies. Some 16,000 people have been arrested since the military ousted Morsi last July, including most of the group’s top leaders. Large numbers of pro-Morsi protesters have also been rounded up and detained by police. 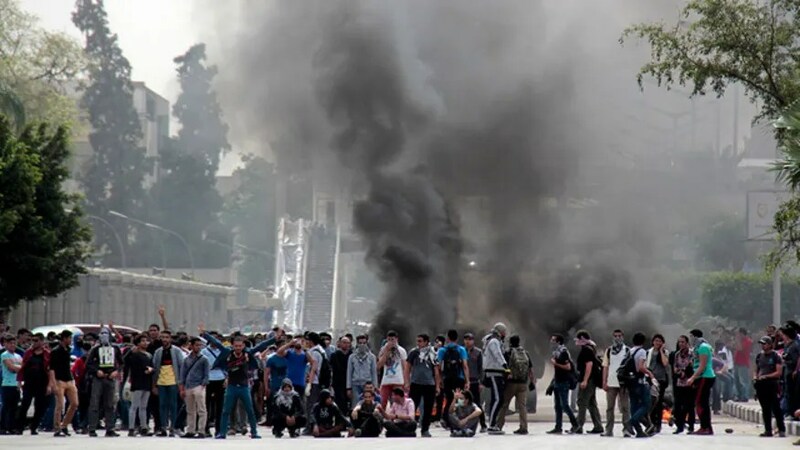 In a separate development, an Egyptian court on Monday banned the April 6 youth movement that helped engineer the 2011 uprising that led to the ouster of longtime autocratic President Hosni Mubarak. That ruling was seen by activists as part of a government- orchestrated campaign to stifle opposition and dissent. It can be suspended by a higher tribunal. A Cairo court ruled in a suit filed by a lawyer who demanded the banning of the youth group over allegations it “tarnished the image of the Egyptian state” and conspired against the country’s national interests. Leaders of April 6 — Ahmed Maher and Mohammed Adel — have been jailed for violating a new protest law that requires that any demonstration must have a police permit.